Apple iPhone is an amazing phone to stay in touch with friends and family. Besides voice calling, you can make facetime video calls courtesy of front facing camera. Also take beautiful pictures of special moments using back camera on iPhone. 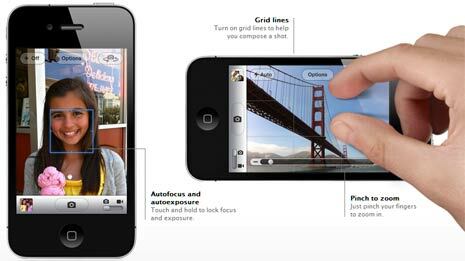 You can easily switch between front and back camera on iPhone to make video calls or take photos. Using back camera to take picture just became more easy with iOS 5 software update. Now you can use camera button on lock screen to directly start camera application and start taking photos using Volume UP button. 1. First make sure you have updated software on iPhone to iOS 5 release. After update, you should notice camera button on the lock screen of your iPhone. Press that camera button on Lock screen to start camera application directly. 2. Once the camera app is opened, press the Volume UP button to take photo on your iPhone. 3. Before pressing button to click image, you can easily focus on object – just touch and hold to lock focus and exposure.